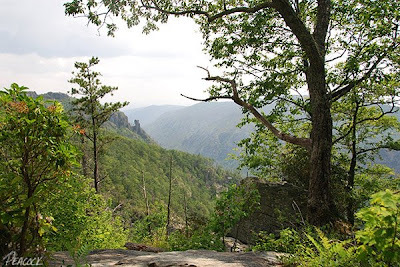 If you look back at my post on Wiseman's View, you will see Table Rock on the other side of Linville Gorge on the right hand side of the photo. From the main road, it's 8.7 miles (mostly gravel) to the parking area/trailhead -- allow plenty of time for the drive, although it's pretty well maintained, it's s-l-o-w going. From the information I found, the road to the top is open from April 1st to October 31st. The one-mile hike itself is moderately steep -- but as long as it's not too hot out it's not bad. The shot above was taken on the trail to the top. I think in the distance you see what is known as The Chimneys. The view from the top of Table Rock is amazing -- it offers commanding views of Linville Gorge, Hawksbill Mountain, The Chimneys and views in all directions. The day we were there it was midday and hazy, and I can't say any of my shots do it justice. I'm looking forward to going back and exploring the area more! Click here for more information. Directions. Exit the Blue Ridge Parkway at Mile 312 and turn left towards Morganton, driving about 5 miles on Route 181. Look for a forest service sign pointing the way to Table Rock (to the right) -- this is Gingercake Road (in 0.3 miles it will turn into Table Rock Road). You will soon leave the neighborhood and the paved road. It's another 8.5 miles to the top (it takes 30+ minutes). At the top the trailhead is clearly marked - along the way to the top there were a couple of side trails, just keep heading up and follow the arrows! 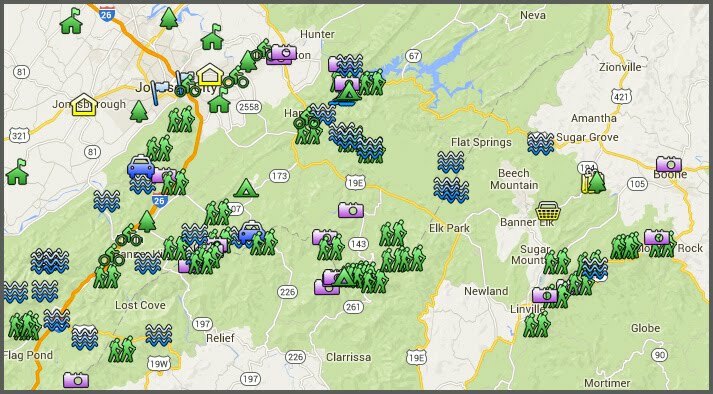 Here's a good introduction to Linville Gorge, complete with map! The next time you make it up that way, ask someone about how to get to "Devils Cellar". The view is amazing, and will make for some of the best photography as the landscape there is surreal. You would have to see it to understand what I mean. It's been a long time since I've been up there, but man, the view and scenery are still vivid in my mind.